A judge ruled Zachary Crus will be released following his latest arrest for violating probation. The brother of Florida school shooting suspect Nikolas Cruz appeared at a probation violation court hearing Thursday where a judge said he would be released. Eighteen-year-old Zachary Cruz was arrested Tuesday on a warrant saying that he was driving without a license and was within 25 feet of the parking lot of a high school. He is on six months' probation with numerous restrictions for trespassing in March at Marjory Stoneman Douglas High School. At Thursday's hearing, Judge Melinda Brown gave him a second chance, releasing him on supervision and reinstating the terms of his probation. His brother, Nikolas Cruz, is accused of killing 17 people at Marjory Stoneman Douglas High School on Feb. 14. Meanwhile, a legal aid group is launching action on Zachary Cruz's behalf. The group, known as Nexus Services, is filing action against Broward Sheriff Scott Israel and other county officials, claiming they violated his constitutional rights. 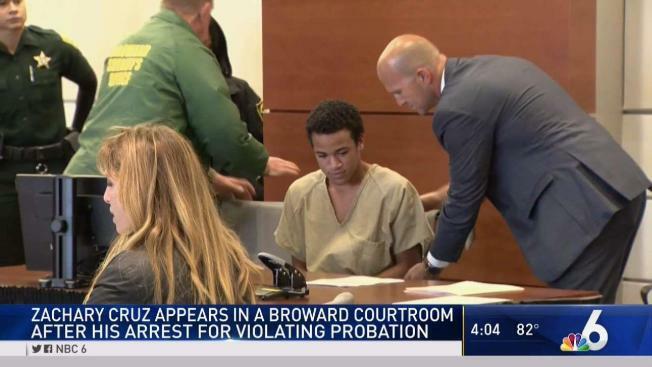 Nexus services argues authorities conspired to keep Zachary Cruz locked up when deputies arrested him on a trespassing charge at Marjory Stoneman Douglas High School weeks after the shooting. After that arrest, Zachary Cruz faced a $500,000 bond at the time but was later freed on a smaller bond and ordered to follow several restrictions – including not to return to any school he is not attending. Officials say he had been told to stay away from MSD, something his attorney on the trespassing charge, Joseph Kimok, had denied. Kimok said in an email Wednesday he has not yet been appointed to represent Cruz on the probation violation but he said he is "very concerned" about the Broward Sheriff's Office's conduct in this arrest. First, he said it is "very unusual" for a probation violation to be filed for driving without a license. He also said Cruz is not banned from being near a school other than Stoneman Douglas. "We all drive past and walk past schools every day and many public parks are located near schools so I'm concerned if, as it appears, BSO has violated him simply for going near a school. That just wasn't a condition we agreed to as part of his plea," Kimok said. Sheriff's spokeswoman Veda Coleman-Wright said Cruz's caretaker reported him because he was driving without a license and insurance. She said violating any law is a violation of probation. The legal group also says guards harassed and intimidated Zachary Cruz, and subjected him to sleep deprivation at Broward County jail. Attorneys for Nikolas Cruz have conceded he is the shooter and say he would plead guilty in exchange for a life sentence. Prosecutors have said they will seek the death penalty.